Yishun Cat Killer On The Run! You are at:Home»The Dark Side Of Singapore»Yishun Cat Killer On The Run! To all the readers out there, Singapore Uncensored is currently seeking your help for more information in the purse of the cat killer. Singapore has a serious enforcement on animal torture and killing animals. Since late 2015 last year, A cat killing spree has occur and yet the cat killer is not apprehended. We invite and welcome those we information to share or to discuss how can we find the cat killers. 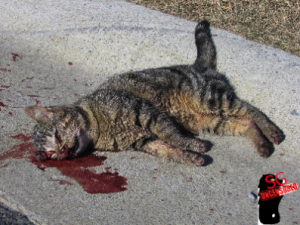 The cat killer has struck more than 21 cats at yishun area. Such an act is intolerable, we urge all netizens to come forward to aid in the arrest of the cat murderer.